Bank quality checks without bank prices, ready to ship in 24 hours. ship with 100% satisfaction guarantee. 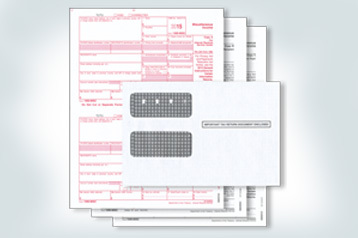 Choose from tax forms, pre-printed and blank kits, and matching window envelopes. Get the FREE SHIPPING promo code for your first order. Very positive. Your company does what it says it will do when it says it will do it. Sounds simple; but, too many companies over promise and under produce. My experience with your company has always been very positive. Maybe I should have been a doctor; my handwriting is often illegible. 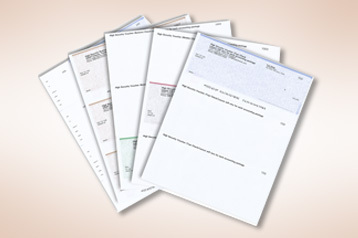 Using computer printed checks provides documents that can be read more easily. I use ASAP's services for personal accounts.Because I order infrequently I have placed only a few orders over a long period. Very few orders, but everyone of them executed with perfection. When I had questions ASAP's customer service representatives answered them professionally and with courtesy. ASAP kept me informed of the progress of filling my order, delivery was fast! Good Service! Good product. What more could I need (aside from better handwriting!)? It is easy to order and I know that the product is a good one! I have done business with ASAP for about 15 years and have always been completely satisfied with the quality of the computer checks and with the speedy delivery of the checks. I have been ordering from ASAP checks for years, and highly recommend them. Prices are very good, service is very quick and re-ordering on-line is a breeze. What is the difference between single checks and duplicate checks? Single checks are what most people use. Duplicate checks have an extra sheet underneath each check, with a special coating, so that when you fill out the check, the copy underneath also shows what you filled out. You detach the check and the second sheet (copy) stays in the checkbook. The second sheet is thin paper and usually white. How much does it cost to get checks? Check prices vary a lot! 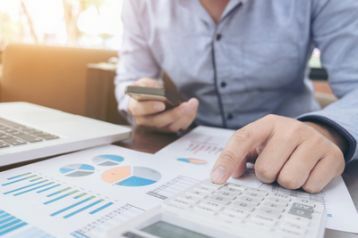 The most expensive ones are usually from your bank (unless you have a "free" checking account, where the bank makes up for it with the monthly fee for the account), and traditional check printers such as Deluxe and Harland Clarke also tend to charge the most. 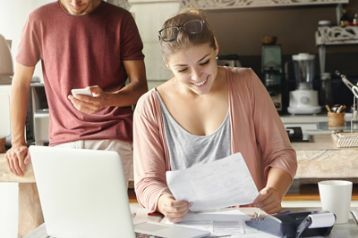 Technology and the Internet have made it possible for "new generation" check printers such as ASAP Checks to sell checks for 50% less than traditional sources - and sometimes even less. For example, 300 manual business checks from Deluxe costs $141, and only $24 from ASAP Checks. 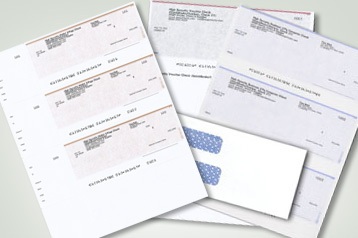 200 personal single checks from Deluxe costs $43, and only $10 from ASAP Checks. Searching forsuper value checks that don't compromise on quality? ASAP Checks has got youcovered with premium products at budget-friendly prices! Guaranteed printer andsoftware compatibility, advanced check security features, and fast orderfulfillment mean you can count on ASAP! Can you order checks from anywhere? Yes. There is no legal requirement to buy your checks from your bank. However, you should be very careful when purchasing checks from a check printer. Ensure that they screen orders (you don't want just anyone to be able to order checks for your account! ), that the checks they sell are well protected with security features (to make it difficult if not impossible for a crook to copy or tamper with your checks), and that they protect your data carefully.Yes. There is no legal requirement to buy your checks from your bank. However you should be very careful when buying checks from a check printer. Ensure that they screen orders (you don't want just anyone to be able to order checks for your account! ), that the checks they sell are well protected with security features (to make it difficult if not impossible for a crook to copy or tamper with your checks), and that they protect your data carefully. How long does it take to get checks from the bank? It can take 1-3 weeks to get your checks from the bank, financial institution and/or traditional check printers such as Deluxe and Harland Clarke - faster if you pay for expedited processing and shipping. New generation check printers such as ASAP Checks usually have your checks printed and ready to ship in just 1 day, and then the delivery time depends on USPS unless you pay extra for courier. Is magnetic ink still required on checks? Yes - the account number and related info on the bottom of checks must still be printed using magnetic ink because checks that are physically deposited at a bank have to be processed using equipment that depends on the check data being precisely printed - including magnetically readable. 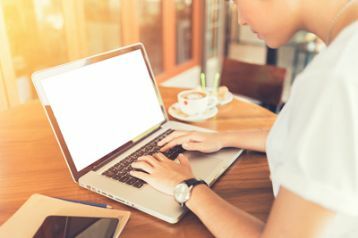 If you are printing checks from most accounting software (such as QuickBooks) or personal finance software (such as Quicken), then any ink, inkjet or laser printer will work. 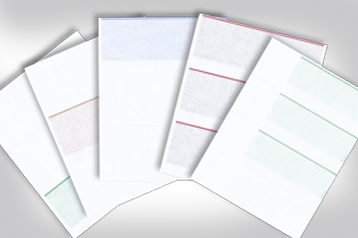 If you are printing on blank check paper which means you also need to print the magnetic numbers and symbols, then you will need a laser printer that works with magnetic toner (mostly some HP models) or an ink / inkjet printer that work with magnetic ink (caution - we have not had good experience testing these devices). 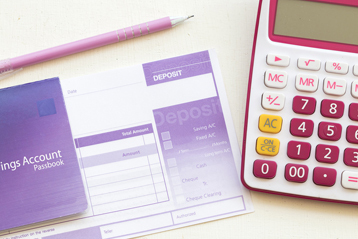 Can you print checks from QuickBooks? 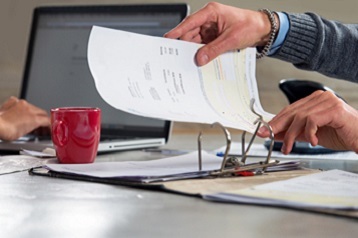 Yes - all 3 types of QuickBooks check (standard 3 per page check, voucher check, wallet 3 per page check) can be printed on any ink, inkjet or laser printer. QuickBooks includes an easy way to align your checks so that the information is printed exactly where they need to be. Be careful when ordering because some printers print checks in "face up" order (ascending) and others print in "face down" (descending/reverse) order.